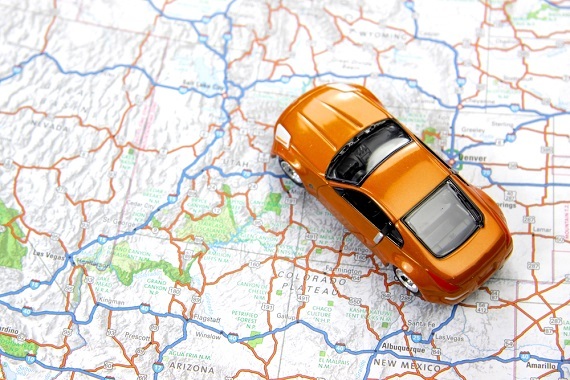 Are you planning a summer road trip? Does your work take you on the road for frequent state-to-state travel? Do you regularly visit family that live in another part of the country? If so, you might find this tool handy: The AAA Digest of Motor Laws. It’s an online compendium of laws and rules related to driving and owning a motor vehicle in the 50 U.S. states, territories, and the provinces of Canada. AAA began producing this digest in paper form in 1930. In 2011, it eliminated the paper version and brought it online. The online version allows you to search by location or by law. You can view laws by specific topics, such as accident reporting, distracted driving, window tinting, “move over” laws, headlight use, impaired driving, licensing requirements, seat belt use and much more. If you’ll be living in another state for a period of time or you have an out-of-state student on your auto policy, you might want to talk insurance implications over with your independent insurance agent. Keys2Drive – tools to help parents and teens throughout the whole learning-to-drive process. Senior Driver Licensing Policies and Practices – “one stop shopping” for information on state driver licensing policies and practices affecting older and medically-at-risk drivers. RoadwiseRx – a tool for understanding how medications may affect you and your driving. Type a name of a prescribed or over-the-counter medication you are taking to learn about any potential driver warnings. The last time you used a taxi, a ride-hailing service or jumped in the backseat of a friend’s car, did you buckle up? If you did, good for you, but you are in the minority. Four out of 5 adults surveyed by the Insurance Institute for Highway Safety (IIHS) say they don’t bother to use a seat belt for short trips. Even more troubling, many who responded said that one of the reasons they don’t buckle up is the false idea that the back seat is safer; others say they simply forget. False assumptions and forgetfulness can have tragic results: IIHS says that more than half of the people who die in passenger vehicle crashes in the U.S. each year are unbelted. Safety belts saved 13,941 lives during 2015. 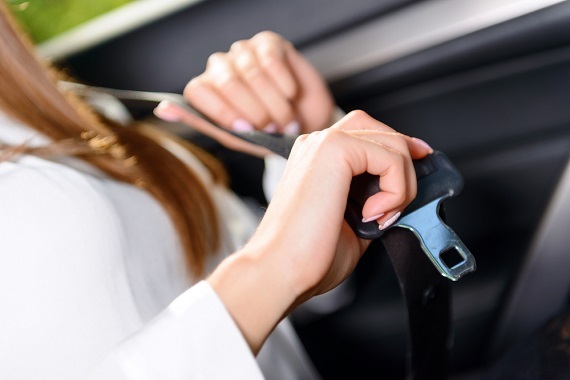 Many front seat riders have gotten in the habit of seat belt use because it is mandated by law in most states, but back seat use is only required by law in 29 states. Plus, many cars have reminders, warnings and alerts for front-seat use, but such reminders usually aren’t available for back seat passengers. If you’re a passenger, try to make this a habit. If you are the driver, it’s up to you to enforce it with your passengers. If you are uncomfortable requiring your backseat passengers to belt up, be aware of this: Unbelted backseat passengers are a safety hazard to the driver. If you are buckled in as the driver, but the passenger who is riding behind you is not, they can be very dangerous. 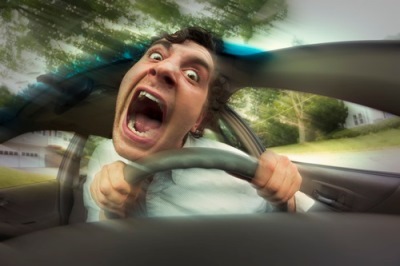 In an accident, their body can be propelled into you or other passengers, causing severe, preventable injuries. As a driver, you should mandate backseat safety belt use – if the passenger complains, tell them it is not only for their safety, but for your safety and the safety of others in the car, too! This week is National Tire Safety Week — and before you embark on all those summer day trips and vacations, it’s the perfect time to check your tires to be sure they are roadworthy and will offer you the best driving security. According to the U.S. Tire Manufacturers Association, tires are safer than ever due to new tire technologies. Government data shows that tire-related crashes decreased by more than 50 percent between 2007 and 2010. 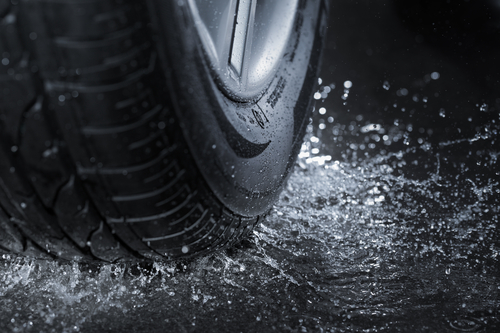 Better technologies have led to reduced rolling resistance and better stability and traction in wet road conditions. Plus, “run flat tires” can keep working for up to 50 miles after a puncture. 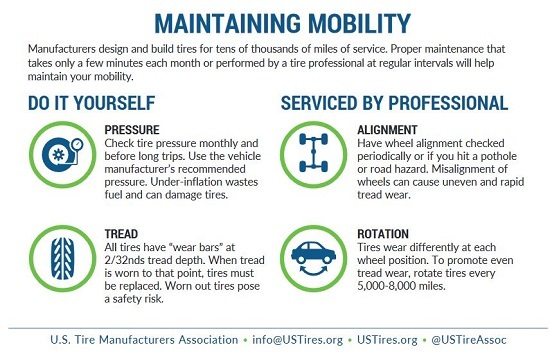 But to keep tires at peak performance, there are a few best practices, summarized in an excerpt from a tire fact sheet infographic provided by the U.S. Tire Manufacturers Association, which offers more information on tire safety. Tire rating lookup – good to check before you buy new tires. Tirewise – everything you need to know about buying and maintaining tires. The life of a tire – We posted this clip a few years back, but think it is well worth recycling – it’s only about 90 seconds, and gives a good overview of what you need to know. How to test and maintain your tires – Although this prior post focused on prepping tires for winter, there’s a handy infographic that sums up the essentials of what you need to know about taking care of your tires. Does your new car have a spare tire? Don’t count on it! – Did you know that more than a third of all new car models are being sold without a spare tire? You don’t want to be caught short on the highway. Buyer beware: If you are in the market for a new vehicle, check to see if a spare tire is included. If not, a tire may be available as a purchase option. File this under “dubious distinctions”: Boston drivers, you are the worst! Your drivers are 157% more likely to get in a crash than the national average – they get in about one accident every three years. In a list of the 200 largest cities, you come in dead last at #200. Worcester, you aren’t much better – you come in at #199. And no smirking from you, Springfield – you have the 5th worst driving record! The honors for the city with the nation’s safest drivers goes to Kansas City, where drivers are 24.8% less likely than the average U.S. driver to get in a crash. The only consolation is that despite the number of bad urban drivers in the state, Massachusetts did not make the list of the 10 states with the worst driving records. The first PSA is an experiment from the Victoria Transport Accident Commission that demonstrates the difference that slowing down by only 5 km an hour can make on an impact … that translates to just over 3 miles per hour. How much of a difference could such a small speed reduction possibly make? See for yourself. “Just Slow Down” is more of a mini-documentary than an ad. It’s from the Winnipeg Police Service. Two young guys tell their experience of surviving a speed-related crash that killed two of their friends. Terribly sad because it is true. Northern Ireland has a very strong spot that has been under a great deal of protest and controversy. The controversy has caused the spot to go viral on the web. We’ve chosen not to embed it here, but you can read about why it’s creating such a strong reaction and see the spot here: People Are Pretty Angry About This Out-of-Control Safe-Driving Ad From Northern Ireland Too real, or not real enough?